Download the three charts shown above—with extra columns!—as a free PDF. See below. There was no room for this material in my newsletter issue about crochet hooks. It pairs well with this one: Deluxe Crochet Hook Diagram. Hey there, New Crocheter? : On the face of it, crochet hook sizes are beginner-level stuff. Question one quirky thing and you can end up in a maze. I did. Over the years I’ve had five key realizations. They build on each other in a logical order, below. I wish I could have read this post when I started questioning! Bookmark this if you’re not quite ready for it yet. Better yet, add a comment about where you’re at. First, download my Crochet Hook Size Charts, and then the Deluxe Crochet Hook Diagram. You might want to refer to them as you read further. 1. I watch exactly where on the hook I make each stitch. I especially watch the starting loop on the hook because it will become the top two loops of the new stitch. My goal is to avoid forming stitches on the tapered part (“throat”) of the crochet hook. Some hooks have such a long throat that I can’t avoid making my stitches there. This is a big deal with some stitches. The taper will give my tall stitches loose top loops. Pictured at right is my first crochet hook (green) and one of my current favorites (gold). My green crochet hook made my stitches look more stringy and uneven than they had to, even for a newer crocheter. A big revelation for me (thank you Nancy Nehring) was that the crochet hook’s true size is where my stitches are made on it. So the other reason I watch where I make stitches on the hook is to know where to measure the hook size. 2. I treasure my slide gauge tool. Needle gauges, the kind with holes, are everywhere. They’re even given out for free at yarn shops and conferences. I tossed them all out and only use a slide gauge. If I could find a reliable source for my favorite slide gauge I’d have it in my shop already. Lacis has had this one for a long time. It’s now also at JoAnn Fabrics, Amazon, Walmart, etc. Here’s another one. You can also search for millimeter calipers. Once I know where on the hook I make my stitches (see #1 above), I measure that with a slide gauge or caliper. I get my true size of each hook in a jiffy. No forcing a hook in or out of the holes of a needle sizer with the risk of scratching the hook in the process! When I did this with all of my crochet hooks, I found out that about a third of them were not the sizes I thought they were (based on how I use them). 3. I base my stitch gauge on my hook size. So stretchy! Easy slip stitch Expedient Cowl. At some point in my crochet life I realized why we have so many crochet hook sizes. When the stitch gauge is based on the hook size and not on the yarn thickness, or personal habit, some amazing crochet fabrics are possible! Starwirbel, Weightless, stretchy slip stitches, and many more. There are two more reasons: it’s the way to get the most polished stitching gauge for each project. It also standardizes our results as an international crochet community. Before this realization I thought the different hook sizes were there to make crocheting with different yarns more pleasant. “I think this yarn is too thick for this hook. Must mean I need a bigger hook size”. That’s a fine reason, but if it were the real reason for the sizes, we’d only need about eight sizes—one per yarn thickness category. See the How Many Crochet Hooks? section of my other crochet hook post. 4. I think in millimeter (mm) sizes. Instead of the “H hook” of my childhood I now think “5 mm hook”. It has improved every day of my crocheting life. I no longer have to deal with traditional hook size systems that are riddled with overlaps and exceptions. Not only that, the mm sizing makes it plain where there are gaps in the standard hook sizes, and how large each gap is. This in turn opened up to me a wonderland of in-between or nonstandard crochet hook sizes. Hello handmade crochet hooks, imported hooks, and other collectibles, including odd manufacturing runs of established brands. 5. The actual number of crochet hook sizes? Infinite. The American Craft Yarn Council (CYC) maintains a chart of 29 steel and 28 non-steel crochet hook sizes according to American and British standards. It’s a good start and includes equivalent mm sizes. I build on it in my crochet hook sizing charts by adding Japanese hook sizes and placeholders for missing sizes. 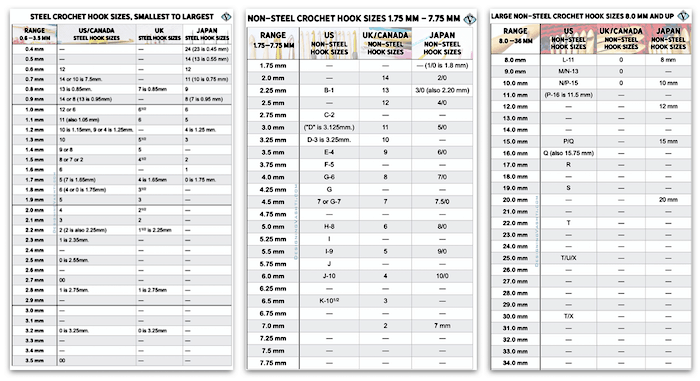 The millimeter measure accounts for all possible hook sizes, including the sizing standards of other countries. I love seeing how US, UK, and Japanese hook sizes all fit together. Does an infinite number of crochet hook sizes seem overwhelming? Every crocheter needs a different number of sizes. Check for yourself with my list of five factors. I think of the non-metric crochet hook sizing systems as being two great crochet traditions (cotton/silk threads vs. wool yarns) that got mushed together, then sprinkled with sizing standards of different countries. It’s quite the heady brew. eel crochet hooks were designed for lace crochet with thread. Steel is very strong for even the finest hook sizes. They’re numbered from 00 to 14 (sometimes 16). The larger the number, the smaller the hook. Non-steel crochet hooks, whether made of aluminum, wood, bamboo, plastic, or glass, get numbered and lettered sizes (from B to U so far) according to an American system. Sizing systems in other countries use different numbering systems. Unlike the steel sizes, the large the number, the larger the hook. Let’s talk about the size “G” hook. The CYC lists three non-steel G hooks: 4.0 mm, 4.25 mm, and 4.5 mm. Each one is a useful size. Labeling all of them size “G” is unnecessarily confusing. Just focus on the millimeter size. A crochet hook that measures 4.0 mm (on the part of the hook where you make the stitches) will always be that size for you. It won’t matter what it’s made of, where you live, or which country manufactured the hook. Feels peaceful, doesn’t it? I’ve added this to an experimental blog post series: Vashti’s How to Crochet Book. Categories: Crochet How-tos, Whys, Free Crochet Stuff, Vashti's Crochet Book, blogged! If you think you know what Tunisian crochet is, make sure you’re up to date! It’s enjoying an exciting renaissance. Subscribe to my newsletter to stay informed about this hot crochet technique. Learn about new Tunisian stitches and find out when new Tunisian crochet patterns and hooks are added to this site. The formerly dense, thermal Tunisian crochet has many new lacy looks with fashionable drape. It’s starring in new yarns for new projects and sometimes co-starring with other interesting crochet techniques in the same project, such as Slip Stitch, Broomstick, and Hairpin Lace. Some of my laciest, most ethereal designs, such as Mesmer and Weightless, are easily created with simple Tunisian stitches. The most distinctive difference between regular and Tunisian crochet is that each complete Tunisian row has two parts: a “forward pass” (begin by putting loops on the crochet hook) and a “return pass” (complete the stitches by working each loop off of the hook). Is it more like crocheting, or more like knitting? During each forward pass, each stitch is held on the hook across a row, and this causes it resemble knitting to some folks. It’s often an enjoyable first experience of crochet for knitters. In fact, classes for it are growing in demand at yarn shops around the country. Check this Events page to find out when I’m teaching Tunisian crochet classes online and in yarn shops. The Liebling Shrug is crocheted with both Tunisian and linked stitches. I think Tunisian crochet has more in common with regular crochet than with knitting. One hook is used throughout instead of two needles. Although the stitches can initially look very different (and some even mimic knitted fabric), they have an innate crochet structure. For example, the return pass resembles chain stitches and is structurally equal to slip stitches. A fun fact that to my mind is the most important of all is this: the lesser-known but handy linked stitches of regular crochet are structurally the same as Tunisian stitches. A Tunisian row can have any number of stitches in it, and the Tunisian crochet hook only need be long enough to hold all the stitches. A Tunisian hook with a long flexible cable attached to it is best for a very long row of stitches, such as for an afghan worked in one piece, or for a shawl or scarf worked lengthwise. At the other extreme, a row with few stitches, such as with Tunisian entrelac, can be worked with a common regular crochet hook as long as it doesn’t have a thick handle along most of the hook’s length. The single greatest difference between the “Afghan Stitch” of the 1960’s-70’s and the breezy Tunisian crochet of today may be the new larger Tunisian crochet hooks on the market (above size K/6.5mm). I rely on them heavily when designing fashionable Tunisian with softly draping yarns. I find that many crocheters and knitters who encountered the “Afghan crochet” of the 1960’s-‘70s strongly associate it with yarns for making the dense blankets and car coats in vogue back then. Usually a worsted weight acrylic or wool yarn was crocheted with an “afghan hook” smaller than a size I tend to use. (I usually start with a size K/6.5mm hook for medium weight yarns and then go up or down hook sizes from there.) This kind of Tunisian is still great for afghans and structured jackets if not worked too tightly. The pink silk vest pictured below features the same basic Tunisian Simple Stitch used for thick afghans for decades. I used a large hook size. There was no “Tunisian curl” (Tunisian crochet doesn’t lie flat when it’s crocheted tightly or with stiffer yarns). Like many crocheters, I was perfectly content knowing one Tunisian stitch–for decades! Tunisian is best known for its versatile basic stitch, called Tunisian Simple Stitch (a.k.a. “Afghan Stitch” and is abbreviated Tss in patterns). This stitch may be even easier to learn than the basic Single Crochet of regular crochet. With its unique and appealing woven appearance it looks good in any yarn. Simply changing the hook size, or the yarn’s fiber content or plying, or alternating yarn colors every row or so, can give an entirely fresh look. To be among the first to know when we add new Tunisian crochet patterns, be sure to subscribe to my e-newsletter.